Written by Kristina Vevia on October 23, 2018 . Have you ever wanted more control over who is in a segment? Or perhaps you have another system that gives you a CSV export of people you want to target for a message, but cannot immediately use it in Customer.io. We now have a solution for you! Manual segments are available in instances where you need more hands-on control, are expecting limited changes, or when a data integration is not available to you. Data-driven Segments. These are the same segments you have always used in Customer.io. Manual Segments. 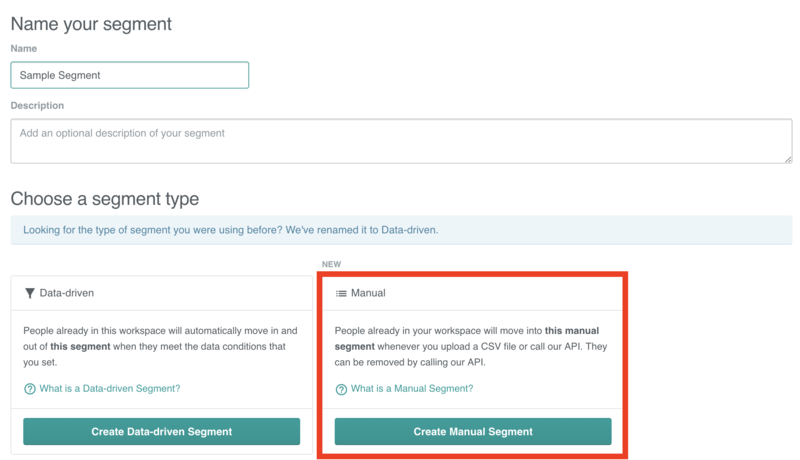 When creating new Manual Segments, you will automatically be launched into uploading a CSV file to lookup existing people by id or email in order to create your segment. You can check out the full instructions for creating Manual Segments here. With Manual Segments, all of these issues have been addressed and more! You can use Manual Segments to use all of our powerful workflow capabilities while targeting a fixed group of people. \Imagine you have a campaign that is in flight and you now have a list of people you no longer want to be in that campaign,, you can add the manual segment as a blocking trigger. If you have another system that you want to integrate with to allow for programmatic changes to your manual segment, then that capability is available as part of our API. You are able to both add and remove people from a manual segment. Questions? Comments? Share them below or send them over to win@customer.io.